Summer in the City is a series introducing APA LA’s members to the latest innovative, proactive planning in cities around the Los Angeles region. Between June and August, we’ll visit several cities whose staff will lead tours, site visits, and presentations that showcase their planning and community development efforts. On July 30th, the second of our 2015 series will take us to the City West Hollywood. Please meet at the Kings Road parking structure (8383 Santa Monica Boulevard) at the corner of Santa Monica Boulevard and Kings Road (on top of Aaron Brothers), enter from Kings Road. We have parking validations for everyone from 5:00 PM until 12:00 AM. At 6:00pm, the group will leave on the Cityline bus for the tour of the Historic Harper District. After approximately 1.5 hours, we will then head to Flaming Saddles and Revolver to discuss the historic aspect of the buildings over drinks. City of West Hollywood Community Development staff will discuss their most pertinent planning efforts, the history of Boys Town and the surrounding neighborhood, and the upcoming LGBT survey they will be undertaking. Then the Cityline buses will head to the Abbey to drop people off if they wish to be dropped off there, or take the people that want to head back to the parking structure. This means that the people that wish to end the tour at the Abbey will need to find a ride back to the parking structure. It’s a very short ride on the #4 Metro (bus picks up at the corner of Robertson and Santa Monica Boulevard and makes a stop at Kings Road) or an approximately $5 Uber/Lyft ride. John Keho, AICP is the Assistant Director of the Community Development Department for the City of West Hollywood. John has worked for the City of West Hollywood since 1997 in several different capacities; first as a planner, then as Planning Manager and now as Assistant Director. Prior to coming to West Hollywood, John was a planner in Plymouth, Minnesota and in Carrollton, Texas. John received his MUP from the University of Illinois. 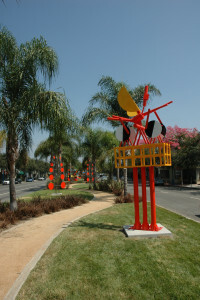 Stephanie Reich is the Urban Designer of the Community Development Department for the City of West Hollywood. Stephanie has worked for the City of West Hollywood since 2012. Prior to this, Stephanie has been an Urban Designer for the City of Glendale, the City of Long Beach, and the City of Santa Monica. Stephanie received her B.S. and M.S. in Architecture from Cornell University and the Southern California Institute of Architecture, respectively. Stephanie is a member of the American Institute of Architects and a LEED AP.